If the sheer number of fuzz pedals available today is any indication, the “noisy” little boxes are perhaps the most popular effects. One outfit that offers a good selection amid the plethora is California-based BMF Effects. 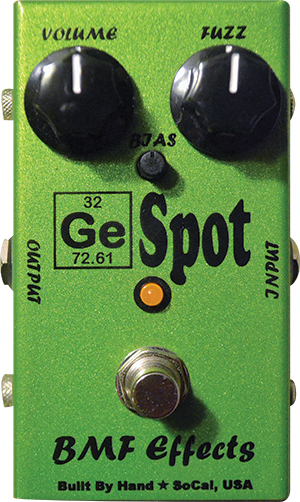 The GeSpot is a germanium fuzz (what did you think the “Ge” stood for?) based on the classic Fuzz Face but with modern appointments. Made in the U.S., it’s compact, true-bypass, and has controls for Volume and Fuzz along with an internal trim pot. An external Bias knob controls voltage going to the circuit’s Q2. In the signal chain, it delivers a kind of malleable ripped-speaker terror that can be used in a variety of musical situations. Its character is tight and gritty, with serious bottom-end. 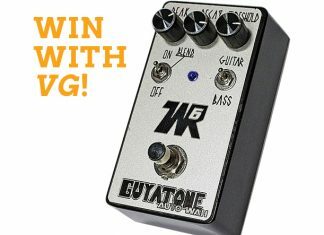 There are earthier-sounding fuzz pedals out there, but what the GeSpot does is cut through a band mix with no volume loss. It can be tweaked to taste, but its stock settings are more than adequate to handle anything from Jimi’s “Spanish Castle Magic” to classic Clapton to ’90s grunge. BMF’s GeSpot Fuzz would make a fine addition to many an effects arsenal, providing awesome clarity, punch, and mellifluous destruction.